"We really love the texture, hardiness and earthiness of the fava beans, however, butter beans or large lima beans may be substituted." Bring a large pot of lightly salted water to a boil. Stir in orecchiette pasta and cook uncovered, stirring occasionally, until tender yet firm to the bite, about 10 minutes. Drain and rinse in cold water. Whisk the olive oil, vinegar, garlic, thyme, black pepper, and salt together in a bowl until dressing is mixed. 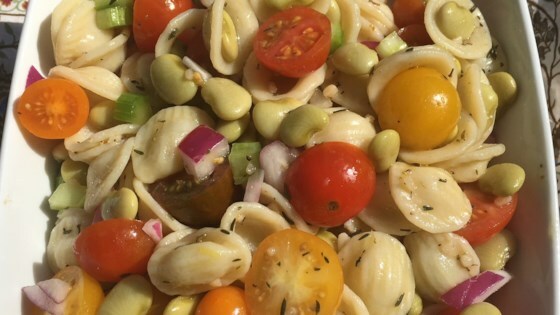 Combine the fava beans, cooked pasta, grape tomatoes, red onion, celery, and basil in a large bowl. Toss to coat with the dressing. Cover and chill at least 1 hour. A flavorful cold bean salad with garlic, lemon, roasted red pepper, and mint. Serve topped with grilled shrimp for entertaining. A crisp Pinot Grigio like Chateau Ste. Michelle complements this dish.